I write this to you from the comfiest chair in the apartment (Papa's chair) with a baby asleep in one room and a toddler asleep in another. She's flying high, friends. I'm like a kid in a toy store: I look around the room at all the things I could do with TWO WHOLE HANDS and no one banging anything or singing or yelling. I think OH! I shall do that thing, but no, THAT thing, or wait...and today, the blog has won. I would go make myself some coffee or a chai latte as a little icing on the napping cake, but I'm afraid Lucy June will wake up before I can get back to the post, and then it will be just another postless day on the Rhodes Log, and my drink will get cold, and I'll reheat it, and I'll walk the baby, and I'll get on instagram, and my drink will get cold...you know the drill. We've enjoyed ourselves some coldish weather the past week. I made a solo trek from Fredericksburg back to Houston with the two littles. They were champs. Only had to stop once to nurse - which was lucky because the temps never got above freezing for the whole drive. I keep thinking: It's been so long since we've experienced a REAL winter. And then I think. But you're in Texas. And I feel stupid. It's good to be back in Houston with the husband even if he is working all the time and Jake is skipping 75% of his naps. My little brother is living with us which makes the apartment feel extra small because my brother is kind of...not small. BUT Wednesday we move into the land of REAL HOUSE dwellers, even if we'll only be small house dwellers. It means so many things. I'll get a double jogging stroller because there will be a place to put it. I'll have my own washer/dryer. Jacob will have a workshop in the garage. Jake will have a yard to play in - or as he calls it "my own park." And for the first time we will be living in a house that we aren't already busting the seams of when we move in. Our first place was tiny. And then our first baby graduated us to a whopping ONE bedroom apartment. And I know. I know. Abraham Lincoln was raised in a 10x15 foot cabin or some such. Jacob reminds me of this ALL the time. We got to go to Mass at our home parish this morning. I REALLY like our parish here in Houston. I'll take my Masses heavy on the incense and teeming with little children, please. A father had to carry his screaming three year old daughter all the way down the center aisle and out the door during the homily and the priest paused, smiled, and made the customary joke about having offended her. And I even laughed because I was so happy to be back (I'm typically very cynical about homily jokes.) It helps that we're currently in a sweet spot as far as kids in Mass go. Jake is old enough to understand that donut holes are on the line and manages to stay quiet - not still - but quiet. And little Lucy June sleeps and stares at people and eats her hand. And I get to listen to readings and homilies and remember that Mass can actually be a prayerful place. We saw our couple-crush. We stopped and chatted them up a little. I told them something that made them laugh (Jacob gave me props for this.) We got in the car afterwards and Jacob said: "He asked me my name again...I keep hoping..."
I'll stop blabbing about nothing in particular and show pictures of my offspring now. Here's: Siblings Almost Play Together. P.S. I'd love any Washer/Dryer thoughts. I'm in a consumer reports rut on the whole thing and torn between buying the washer of my dreams or just a clunker because online appliance reviews are a black hole and also kind of shady. Ugh Ugh. P.S.S. If you come here often and want to make it official, you could be my ONE HUNDREDTH Google follower. Now wouldn't that be fun? Nom nom, children. These are great pictures. :) Truly heartwarming. So much cuteness! TIGHTS! Gah, lovely. Congratulations on being an (almost) house dweller! It is such a great thing, small house or not, it is so nice. Also, your kids are incredibly adorable, so so cute. Those pictures of Jake handing Lucy toys were melting my heart. And I wish I wasn't a follower so I could be the 100th... but then I wouldn't have been notified of all your past posts and read them asap and that would have been tragic, so I changed my mind. 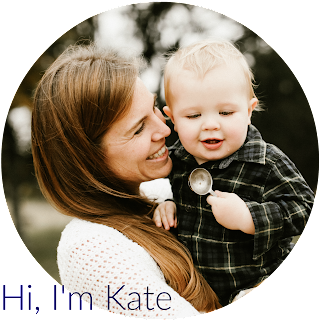 Thanks for leaving a comment yesterday Kate, I love to "meet" my readers. I have been about your digs before too, before I actually had one of my own and didn't know how to comment. It's a funny thing this blog world, your read thousands of enteries and I "follow" quiet a number, but perhaps I should write down those that inspire me the most and keep going back, bc its easy to lose track. Your in the calm before the storm at Mass…..we're definitely in the storm, right in the eye of it infact. My two big boys served on the weekend, and between trying to signal to them to get their hands out of their pockets and the 6 year old telling me she was hungry and the 2 y.o. licking my nose in hysterics , i didn't hear much of dear Father's homily. But hopefuly i received enough grace to pull me through to next Sunday. Parenting joys! Your kids are adorable. I have a Lucy too! And that rug/blanket is gorgeous….please tell me you didn't crochet that, or i'd be oh so jealous?!?! Hi from another Houston mom! I have had really excellent luck with my Whirlpool Duet washer and dryer. Low maintenance, good longevity, no funky smells, etc. Highly recommend! We live in a studio and Nat basically owns the place. Jimmy loves to remind me that St. Bernadette was raised along with many sibs in one room......okay, fine, but a room for Nat would be nice. A big congrats on the house!! Congrats on the house! Moving into real house with a real yard and lots of dirt for gardening had made me a way happier person and better mom. Regarding washers, etc. Oskar is the world's most obnoxious purchaser of appliances. He will never tire of online reviews or consumer reports, and even makes ridiculously complex spreadsheets to compare various models of whatever it is we're buying. I should not complain because he never buys us a lemon, but the spreadsheet stuff is just not how I operate so it makes me a little crazy. Anyway, he did his spreadsheet magic for our recent washer/dryer purchase and we ended up with a really affordable LG set. It gets the job done and works well for washing diapers. Also water and energy efficient, yada, yada. If you're interested let me know and I'll find the model number and whatnot. Lastly, your Lucy has the biggest, brightest baby eyes. Very cute! You have kids and I'm guessing you cloth diaper, so definitely get the best and most energy efficient you can, is what I was going to say, but just go with the comment above mine and steal her research! See if you have a Sears scratch and dent place near you, maybe that's not what they are called, but we have one that has all new appliances, they just all have a little wear and tear because of shipping, or they were floor models. We have bought our washer, dryer, and fridge from there because seriously, they ain't gonna be perfect for long in this house. Plus a washer and dryer are usually not the centerpieces of a room, ya know? Ahhh the washer and dryer debate. It's depressing reading the reviews of all the new ones. We ended up buying a used one because all the good reviews were on the older ones. With all the babies and incense, it sounds like y'all might go to Holy Rosary in Midtown! Am I right? Congrats on the end of apartment living! !